Marissa Meyer, author of the fantastic fractured fairy tale science fiction stories Cinder, Scarlet and the soon to be released Cress has a new book on her horizon for 2015 based on a 2012 NaNoWriMo project. Even better? 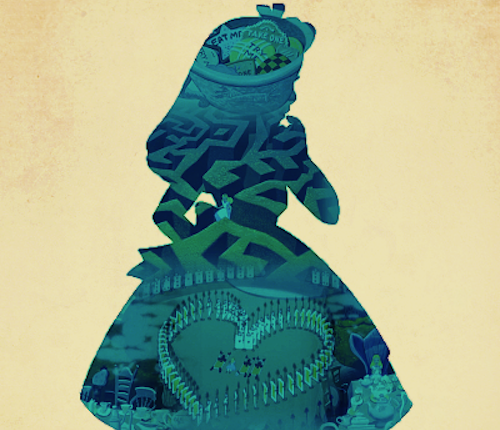 That novel is a prequel to Alice in Wonderland! Our hearts just tore apart in happiness. The novel, entitled HEARTLESS, will focus on the, “tale of how a marquis’s teenage daughter became the infamous Queen of Hearts. It will be a story of whimsy and madness, passion and tragedy, ravens and writing desks.” We cannot wait. More information about the project can be found on Meyer’s blog. Black Milk Clothing the purveyor of all clothing nylon and nerdy has added another franchise to their growing roster (which includes Star Wars and Lord of the Rings) but this time around it’s our favorite franchise of all: Harry Potter. The one downside to this is that means that it’s officially licensed Warner Bros. merchandise and therefore everything Ravenclaw is silver and blue and covered in ravens, not blue and bronze and covered in eagles. Sorry Ravenclaws! You can check out the full line of awesome available for sale now through Black Milk. May we suggest the awesome Deathly Hallows leggings? The machines started popping up around the world. The offer was tempting: with a simple blood test, anyone could know how they would die. But the machines didn’t give dates or specific circumstances-just a single word or phrase. DROWNED, CANCER, OLD AGE, CHOKED ON A HANDFUL OF POPCORN. And though the predictions were always accurate, they were also often frustratingly vague. OLD AGE, it turned out, could mean either dying of natural causes, or being shot by an elderly, bedridden man in a botched home invasion. The machines held onto that old-world sense of irony in death: you can know how it’s going to happen, but you’ll still be surprised when it does. This addictive anthology–sinister, witty, existential, and fascinating–collects the best of the thousands of story submissions the editors received in the wake of the success of the first volume, and exceeds the first in every way. 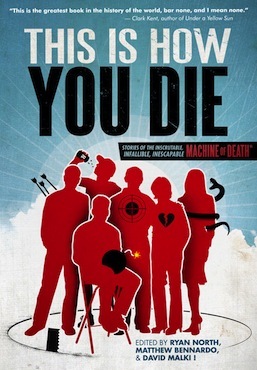 WHY WE’RE EXCITED: A follow up to the intriguing anthology Machine of Death, in which a machine predicts how you will die with hilarious consequences. No, really.